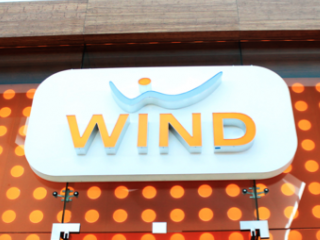 Wind Mobile will revamp its price plans starting on April 9th, focusing on lower prices with stricter data limits and a revamped tab system that makes it easier to get an expensive phone on any plan. The carrier plans to lower its most expensive plan from by $10 to $50, offering 10GB of “full speed” data and 1GB of US roaming. The $50 plan will be reduced to $45, reducing maximum data to 5GB and removing US roaming, which goes for $15/month on its own. A $10/month add-on will still be available for an extra 10GB of data, bringing the theoretical maximum to 20GB. While Wind advertises unlimited data, its Fair Use policy throttles users to 256kbps down, 128kbps up after 5GB. From there, the company will retain its $25/$35/$40 hierarchy, with slight changes to current plans. 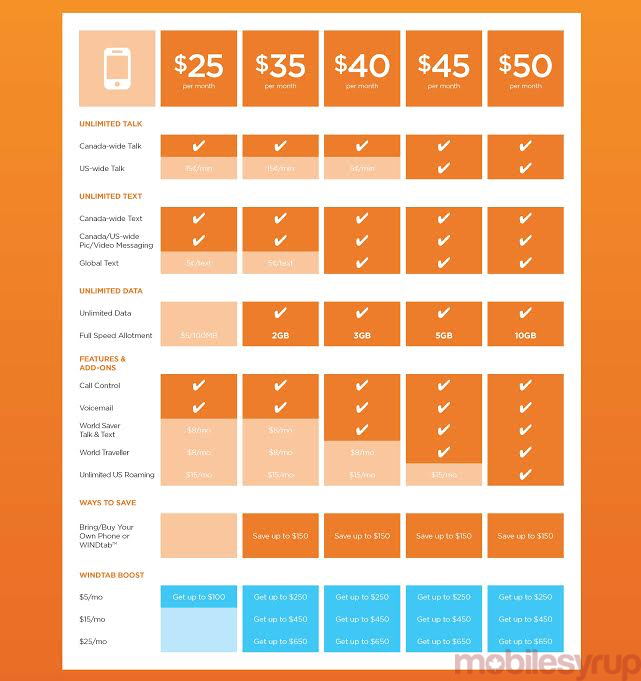 All plans, including the $25 one, will offer voicemail, for example. The $35 and $40 plans now offer 2GB and 3GB of data, respectively, which further incentivizes heavy data users to purchase the all-in-one $50 plan. Wind also plans to revamp its tab, giving three options to every customer who wants to finance his or her new phone in different ways. The tab now goes up to $650, which is paid back with $25 instalments over two years; there’s also a $450 option, paid back with $15 instalments; and a $5/month option, to a maximum of $250. Obviously, these numbers don’t quite add up, so Wind fills in the rest. For example, $25/month over 24 months is $600, not $650; Wind plans to forgive the remaining balance if the phone is paid off over two years. Update: In response to questions about how Wind fills in the remaining portion of its tab, the company had this to say. The WINDtab and how the program works remains the same. Every month we’ll apply 10% of the customer’s monthly payments to their WINDtab balance, and we promise to clear any remaining WINDtab balance after two years. Full details are here on our website https://www.windmobile.ca/why-wind/ways-to-save. This new system is a way customers can boost their WINDtab to save even more on the price of their device at the time of purchase. The WINDtab Boost is completely optional, and customers can choose to add no boost and save $150 off of the price of a new phone or $25/month to save up to $650. It puts the customer in control and allows them to not have to pay extra for a subsidy that they may/may not use – Customers can choose a plan with the features they want, choose the phone they want and choose the price they want to pay for the phone. The new tab applies equally to customers on any of the $35, $40, $45 and $50 plans, unlike previously where the maximum tab was determined by the plan price. The company is also revamping its overly generous BYOD credit system, lowering it to $150 across the board. The takeaway here is that Wind is pushing users to higher-cost plans by differentiating between the amount of data one can use, similar to the way it works on other Canadian carriers. Previously, all users were throttled after 5GB regardless of plan, or at 10GB with a $10 Premium Data add-on. Customers on the $50 plan actually get a considerable amount more value with this new strategy. While Wind has a long way to go before launching an LTE network, it is in the process of upgrading its existing infrastructure to Dual Cell HSPA+ on more towers in its service areas, while improving the density of its existing network. With Wind launching the Samsung Galaxy S6 on Friday along with nearly every other Canadian carrier, it is using its lower-cost, higher data limit plans to pull in some fresh customers, especially as an increasing number of users begin emerging from two and three-year plans beginning this June. UPDATE – April 9th: Wind Mobile has gone live with its new plans and new WindTab options.